If your problematic tooth isn’t already missing, you’ll need to have it removed. 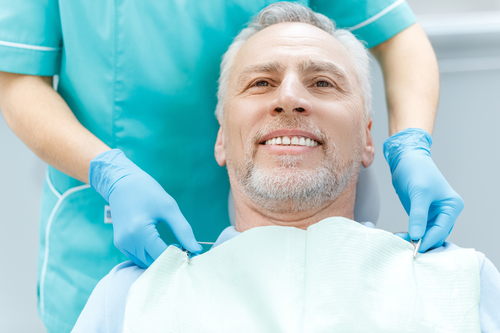 In some cases, your dentist will be able to insert the implant immediately after the extraction. In other instances, we’ll need to remove the tooth and place a bone graft in the socket. If you weren’t able to get your implant placed the day of your extraction, you’ll go through a period of time to heal and allow the bone grafting material to integrate with your body’s bone. This may be about 2 – 3 months. Placing the implants is easy when you have an expert team like the professionals of Wyndham Dental in Wyndham performing the treatment. The procedure will take about an hour or less. Once the implant is placed within the jaw, it will need to fuse to the surrounding bone which can take about 4 months or so. When our Wyndham dentist determines that the bone and implant are stable enough to withstand the pressure of a tooth, we’ll take the necessary impressions or scan of your teeth in order to have your permanent restoration made – which make take about two weeks. The wait is finally over. This will be the easiest appointment of them all. You’ll leave the office with your permanent new tooth in no time! If you have a missing tooth or need to have one removed, we’ll gladly see you for a consultation to determine if an implant is the best route for your smile. The residents of Wyndham have trusted Wyndham Dental with their oral care for over 30 years and we look forward to doing the same for you!